This signature Southern dessert is composed of a supremely moist banana-pineapple cake dressed in a luscious cream cheese frosting. It’s spiced with cinnamon and nutmeg, and studded with pecans. 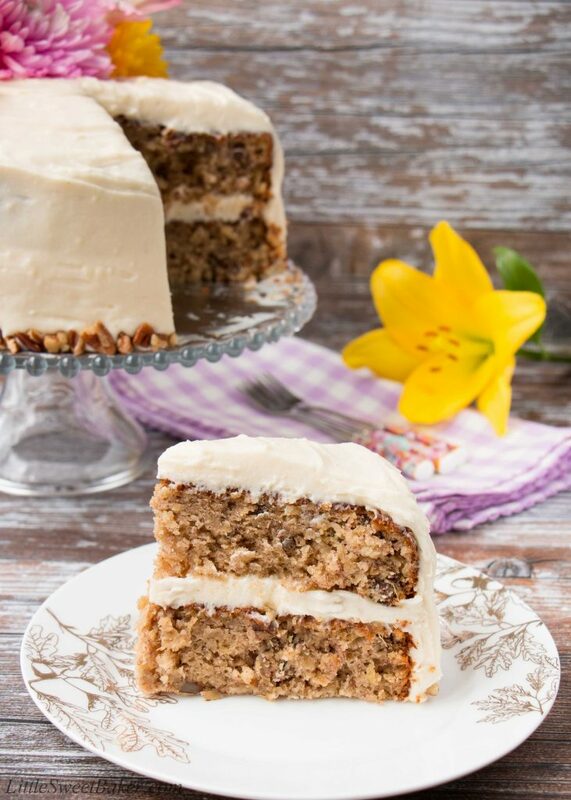 One bite of this classic hummingbird cake and you’ll be in sweet heaven! I’m celebrating a big milestone birthday this weekend. It’s my “forty & fabulous” birthday! So I’m celebrating a fabulous birthday with a fabulous cake. The cake itself is very similar to a banana bread. 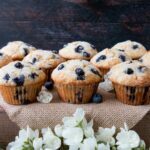 It’s delightfully moist, flavorful and dense. 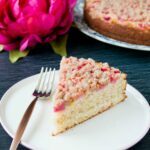 It has sweet chunks of pineapples and nutty pecans throughout the cake. 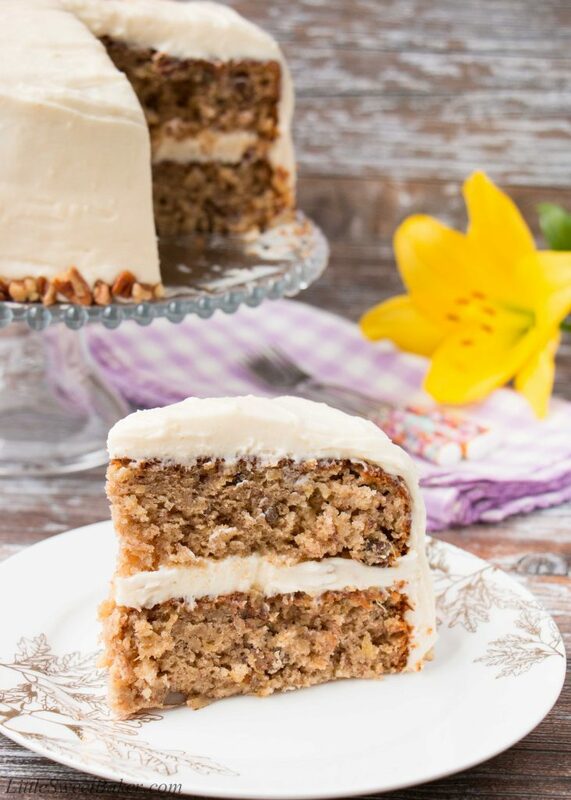 The crunchy texture of the pecans gives a nice contrast to the softness of the cake. The tropical fruit flavor of the pineapples along with the spices and warm flavor of the brown sugar makes this dessert suited for all year round. 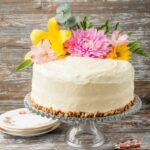 And the thick layer of cream cheese frosting gives this hummingbird cake a perfect sweet creaminess. This signature Southern dessert is composed of a supremely moist banana-pineapple cake dressed in a luscious cream cheese frosting. Preheat oven to 350F. Butter and flour two 9″ round cake pans. Sift together the flour, baking soda, cinnamon, nutmeg and salt. Set aside. Using a stand mixer with paddle attachment or handheld mixer, beat both sugars and oil for 2-3 minutes until smooth. Add in the eggs one at a time, mixing well in between, then mix for 2 minutes until light and fluffy. Mix in the vanilla, bananas and pineapples until just combined. On low speed, add the dry ingredients in thirds, beating until just combined. Fold in the pecans. Divide the batter evenly between the two prepared cake pans. Tap the pans firmly on the countertop to remove any air bubbles from the batter. Bake for 40-50 minutes or until a toothpick inserted into the center comes out clean. Cool completely before frosting. 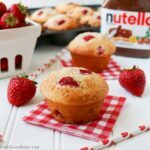 Using a stand mixer with paddle attachment or handheld mixer, beat the butter, cream cheese, vanilla and salt until smooth and creamy (3-5 minutes). Slowly add in the powdered sugar, beating until light and fluffy (5-7 minutes). 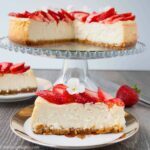 When ready to assemble, level the tops of the cakes with a serrated knife. Place one layer cut side down on a serving plate. Spread one third of the frosting on top. Place the other layer cut side down on top and spread the remaining frosting all over the cake. Refrigerate for 30 minutes to firm up the cake to make it easier to slice. Leftover cake can be covered and stored in the fridge for up to 3 days. Recipe from The Back in the Day Bakery Cookbook. You’re very welcome, April! I’m so happy everyone enjoyed it and happy belated birthday to your mom! This cake is gorgeous and delicious! Love it! Happy Birthday!! But, but…you’re 40?! I don’t believe it, you don’t look a day over 25! The cake is gorgeous, just like you. Lily, you made this cake look so festive! 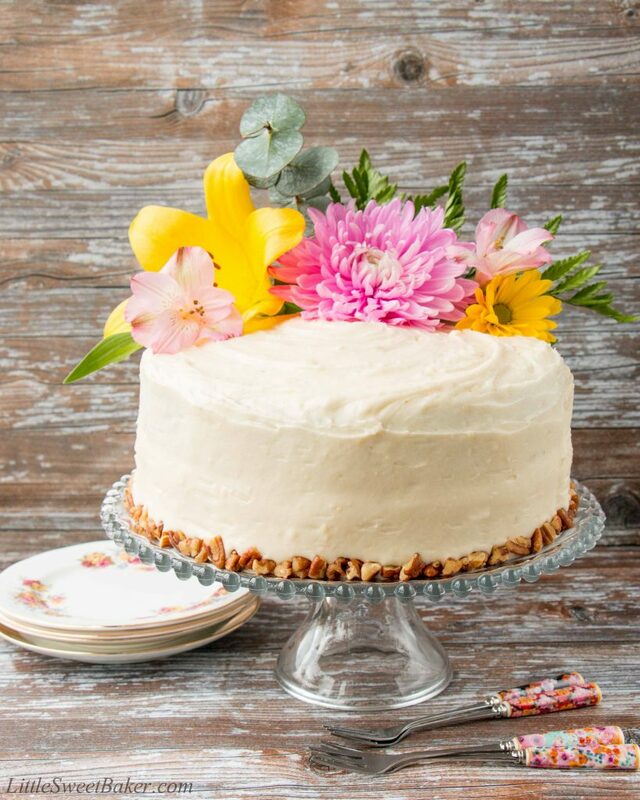 I still haven’t ever made a hummingbird cake, which is funny because I love carrot cake! The baking soda gets sifted with the dry ingredients, right? Really pretty! We’re going to make it tomorrow! Thank you for sharing your talents so willingly and well. Yes, you’re right. Thanks for catching that. I hope you enjoy the cake! Oh la la! I adore Hummingbird cake and made it for the first time just this year! Yours is absolutely gorgeous. I love that you decorated it with flowers. Thanks so much for sharing with us at FF this week. I hope you have a sweet weekend!